Intel has announced details on the expansion of its portfolio of 100G silicon photonics transceivers beyond the data centre and into the network edge, unveiling details on new silicon photonics products that are optimised to meet the large bandwidth requirements of new 5G use cases and IoT applications, while withstanding harsh environmental conditions. The company says the move to 5G, along with a ramp in existing network traffic such as video streaming, is straining existing communications infrastructure that must support an expanded spectrum range including mmWaves, massive MIMO and network densification. Hence the need for its latest 100G silicon photonics transceivers to meet the bandwidth demands of 5G wireless fronthaul applications. These transceivers are designed to meet the unpredictable outdoor conditions of cellular towers with the capability to support optical transport to the nearest baseband unit or central office at distances of up to 10km. Intel’s integrated laser into silicon approach makes its silicon photonics transceivers suitable for mass production and deployment as 5G infrastructure increases. Samples of Intel’s silicon photonics transceivers targeting 5G wireless infrastructure are available now, with production start for the new silicon photonics wireless modules scheduled for the first quarter of 2019. Intel projects the total market opportunity for its connectivity business, which includes silicon photonics, to grow from $4 billion today to an estimated $11 billion total addressable market by 2022. Intel says it is now shipping its 100G data centre products at a run rate of more than a million units per year. Earlier this year, Intel demonstrated its 400G silicon photonics capabilities, with volume shipment of 400G modules slated for the second half of 2019. What’s New: Intel today announced details on the expansion of its portfolio of 100G silicon photonics transceivers beyond the data center and into the network edge. 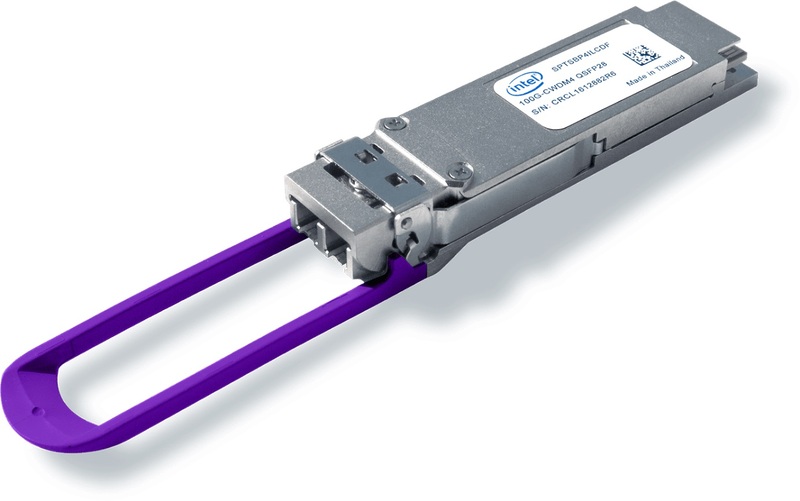 At the European Conference on Optical Communication (ECOC) in Rome, Intel unveiled specifics on new silicon photonics products that are optimized to accelerate the movement of massive amounts of data being generated by new 5G use cases and Internet of Things (IoT) applications. The latest 100G silicon photonics transceivers are optimized to meet the bandwidth requirements of next-generation communications infrastructure while withstanding harsh environmental conditions. Why It’s Important : In the data-centric era, the ability to move, store and process data is paramount. Intel’s 100G silicon photonics solutions deliver tremendous value by offering fast, reliable and cost-effective connectivity. The industry’s move to 5G, along with a ramp in existing network traffic such as video streaming, is straining existing communications infrastructure that must support an expanded spectrum range including mmWaves, massive MIMO and network densification. Intel’s latest 100G silicon photonics transceivers meet the bandwidth demands of 5G wireless fronthaul applications. These transceivers are designed to meet the harsh outdoor conditions of cellular towers with the capability to support optical transport to the nearest baseband unit or central office (up to 10 km). Intel’s integrated laser into silicon approach makes its silicon photonics transceivers suitable for mass production and deployment as 5G infrastructure ramps. 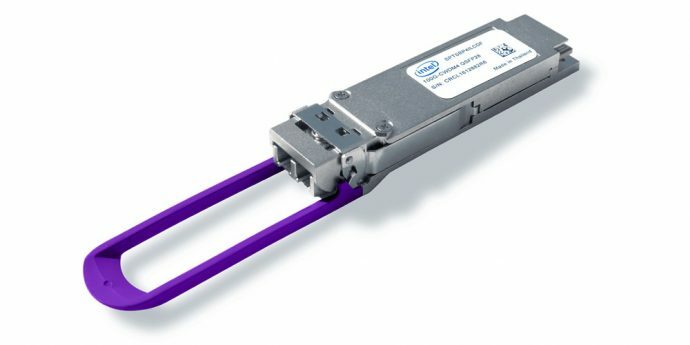 Samples of Intel’s silicon photonics transceivers targeting 5G wireless infrastructure are available now. Production start for the new silicon photonics wireless modules is scheduled for the first quarter of 2019. What’s Next : Intel projects the total market opportunity for its connectivity business, which includes silicon photonics, to grow from $4 billion today to an estimated $11 billion total addressable market by 2022. Since introducing its first 100G silicon photonics product in 2016, Intel has ramped production and is shipping its 100G data center products at a run rate of more than a million units per year. Earlier this year, Intel demonstrated its 400G silicon photonics capabilities. Samples of its 400G silicon photonics products are expected to be available next quarter with volume shipment of 400G modules slated for the second half of 2019.